That opinion was turned on its head just a few weeks later. On the last day of my annual spring trip to Potter County, PA I had arrived a little early for a planned rendezvous with my fishing partner at the bridge on the Kettle Creek special regulations area. It was high noon on a bright, sunny day—not ideal fishing conditions by any means. Even so, I decided I might as well continue fishing while I waited. I was standing on the bank, and could see numerous trout holding in the clear water in front of me. Aside from an occasional half-hearted nip, they were ignoring the Pheasant Tail nymph I was offering. I was sure I didn’t know this man, and wondered how the heck he knew my name. He released the trout, and immediately hooked another. “Hey Mary, I’ve got another one!” he exclaimed. The woman in the lawn chair made a comment, and I sheepishly realized that she must be his wife or girlfriend and also named Mary. “I actually have a couple of those,” I said. My angling neighbor generously shared with me the information that he was fishing the Weenie dead-drift with one small shot to take it down a bit. I rigged accordingly, and tossed the fly out in front of me. My position on the high bank gave me a perfect view of the fly, the fish, and their reaction. As the fly sank down through the water column, half a dozen trout raced over to it and one inhaled it as if he’d been waiting for it all day. I too caught three trout in three casts. Then my friend arrived and the game was up. I hated to quit, but we’d pushed our departure as far back as we dared. The trip was over, time to head home. On the first day of the following year’s trip, we found ideal weather and water conditions. Every rock we turned over had several big March Brown nymphs with wing pads dark and bulging, clearly ready to hatch. We tried March Brown nymphs, of course, along with wets, dries, and emergers and all of our usual favorite flies. But nothing seemed to be working. In desperation I decided to try a Weenie. It worked like magic, again, and continued to do so for the remainder of our stay. Needless to say, the Green Weenie has earned a permanent spot in my fly box. All hot fly patterns run their course, and the Green Weenie no longer works quite as magically as it did in those early days. It’s still more than worth carrying, however, and has saved many a trip for me. The one caveat I would offer is that the Green Weenie does not seem to work as well on Western waters as it does here in the Mid-Atlantic region. Why this should be I cannot say. Like all great fly patterns, the Weenie has spawned variations. I tie three basic versions, as shown below. I have also experimented with just about every other color of fluorescent chenille I could find. Of these, orange, fire orange, and yellow have proved the most effective. A friend of mine also ties Weenies in more naturalistic shades of olive, tan, brown and black and does quite well with them. Notes: Form a vertical loop of chenille as a tail, approximately as long as the hook gap. Wrap the chenille up the shank to the head position and whip off. 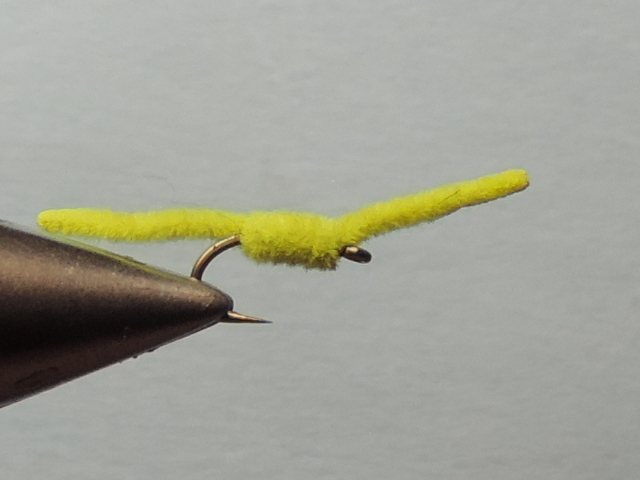 Take care with the first turn of chenille to cover the tiedown of the tail loop but not push it out of position. I fish the Standard Weenie without added weight in shallow or slow-moving water. In deeper and/or faster water you can add as much weight to the leader as you’d care to. Notes: De-barb hook and mount bead, then build the Weenie behind the bead, as per the instructions above. The Bead-Head Weenie is a bit smaller, and of course the weight of the bead provides a faster sink rate and just a bit of flash. Sometimes the weight of the bead is just right for the situation at hand. Notes: Tied as a chartreuse San Juan Worm, proportions as you like. This pattern does bear a passable resemblance to an Inchworm. The Finesse Weenie is fished with or without weight added to the leader in situations where the fish refuse the Standard or Bead-Head Weenie. The question arises, why does chartreuse work so well? One friend of mine told me very seriously that although she didn’t know why the Green Weenie worked at other times and in other places, she was sure that it was so effective in the autumn on a particular stream we both fished because of the many Fall Webworm nests in the trees lining the stream’s banks. I was puzzled, because I knew that the Webworms are a sooty black color. She said yes, but that they had bright green insides. In the interest of “science,” I got hold of one and tore it in half. Sure enough, the caterpillar had a bright green interior, presumably due to its diet of leaves. Still, it was not fluorescent chartreuse. And I wondered how exactly a trout managed to get a look at a Webworm’s innards before eating it. Another friend came up with her own fascinating theory about the color chartreuse. She asked me if I’d ever been driving at night and come upon a road-killed animal and seen the blood fluoresce green in the car’s headlights. I said no, not really. However, I’ve related this conversation to a number of people and several have said that yes, they do see this. Do fish see and/or react to chartreuse as blood? There’s no way to tell, although fish clearly do not see color in the same way humans do. In the U. K., for instance, the Partridge and Orange wet fly is a favorite for use during Olive hatches. We fly fishers and tyers are always seeking explanations for our experiences on the water, and that’s as it should be. However, all theories aside, there’s no denying that many fish seem to have a fatal attraction to chartreuse and are often eager to put flies of that color into their mouths. That’s all I need to know. NOTE from J Stockard: We did a quick search of our product database for the word “chartreuse”. We came up with almost 400 products with that color in the name! Very interesting Mary. I’ve heard Lefty’s quote about this color many times, and always enjoy it. I’ve never tried that fly but have seen it before and have always assumed it was intended to be some sort of leech pattern. The shape of the “standard” version is about like that of the first green leech pattern I ever tied and used…which caught one of the largest trout I’ve caught on a fly. I used more of a light olive green rather than chartreuse back then, but the shape is about the same. Have you ever considered that maybe the Weenie could be taken for a leech? Does anyone you know who uses it a lot strip-retrieve it, for example? Just curious. I’ve never before heard of the Weenie being used as a leech pattern. 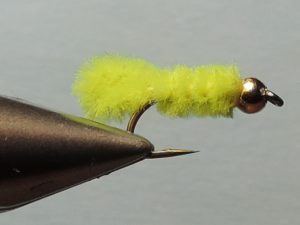 When my buddies and I first started using it in upstate PA, we had one dyed-in-the-wool nymph fisherman in our group and he was just deadly with his preferred methods. His nickname was “Hoover,” because he vacuumed up all the fish. You didn’t want to fish down a run behind him. He was a hold-out on fishing the Weenie. The man was also a fine artist, and the Weenie clearly offended his aesthetic sensibilities. When the rest of us where hauling in trout on it, he finally gave in and asked me for a couple of flies. I crossed paths with him later, and asked how he was doing. “Nothing!” he replied. I asked how he was fishing it, and he said he was fishing it like a streamer. I told him to try fishing it like, ahem, a nymph. He started catching trout right away. As for myself, I never actively retrieve it. It seems to work about any other way–on the dead-drop, drifted, or on the swing. The one exception is with stocked trout. When I find a a pool full of otherwise inactive fish. I’ll cast the Weenie out among them and let it go to the bottom. Then strip in as fast as I can. This often, but not always, will provoke a few strikes. Well it must just be the color itself then Mary, as you suggest. And I guess that’s not all that hard to believe–I often find myself wanting to take a gulp of anything the color of Guinness. It is hilarious how such a simple fly can be so effective. So often we spend time adding all sorts of features when sometimes the best solution is simplicity. A few blogs ago, Mike Vorhuis described his olive Quasimodo nymph. It only has tails, a body, and a uv glue hump. I just tried it a week ago and did quite well with it. I can’t wait to try a green weenie in the hopes of someone asking me “What are you using?”! Thanks for sharing this. Wouldn’t it be funny if we all discovered that three turns of thread on a hook shank proved to be the most effective fly of all time? I think the phrase “Coq de Leon” would be re-purposed to name a soft drink, and Ted Gordon and Meg Boyd would turn over in their graves. Some years ago I subscribed to “The Flydresser,” the magazine of The Fly Dresser’s Guild in the U. K. I recall one article on Minimalist Flies. One of the patterns in the article was a hook with the shank painted red. That’s it. On another note, I don’t know if anyone does this anymore but years back there was a tradition in the Trenton, NJ area of locals fishing, with great success, a bare gold hook for River Herring during their springtime run up the Delaware River. There are things we fly tyers do for the fish, and things we do for our own amusement. 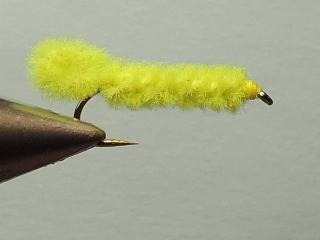 Frankly, I think an awful lot of the exertions we engage in with fly tying are for us. Not that there’s anything wrong with that! I’m happy to share, Joe. I always tell people who have never heard of the Weenie, “Don’t blame me, I didn’t name it, I just fish with it.” Good luck, I hope it produces well for you and garners some amusing comments.